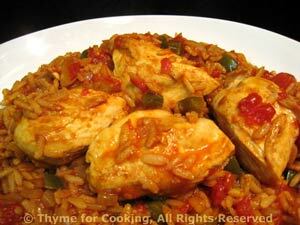 Chicken with Spanish Rice, Weekly Menu Planner. You could use leftover Cornish Game Hen - but we always eat it the next day for lunch. I use a quick cooking brown rice in this dish; it cooks in 20 minutes. You can use whatever rice you choose (except instant) just adjust the liquid and cooking time accordingly. The tomato juices cook right into the rice, adding color and flavor! Heat oil in deep skillet over medium heat. Add chicken breasts, and brown on both sides, about 5 minutes each. Add chili powder, leek, pepper, and garlic. Sauté for 5 minutes. Open tomatoes and drain liquid into a bowl. Chop the tomatoes and drain again. Add drained tomatoes, Worcestershire sauce and rice to pan. Measure the drained liquid and add enough water or chicken stock to equal 1 cup (or however much liquid your rice package calls for). Pour this over the rice/vegetables in the skillet and stir well to combine. Lay the chicken breasts on top of the rice and cover. Reduce heat to simmer and cook until rice is done, about 20 minutes - check rice package. When done, serve - either from the pan or arrange nicely on a platter. 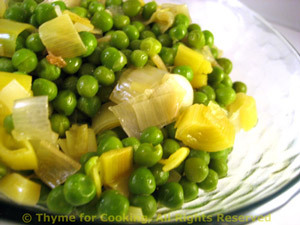 I try to keep prepared, canned and frozen food to a minimum, but some foods, like peas, I think are actually better frozen; as well as difficult to get fresh. The leeks add interest, mild onion flavor and color. Trim leek, cut in half the long way and rinse thoroughly. Slice half of leek (reserving other half or another use). Heat oil over medium heat in small skillet or saucepan. Add leek and sauté until tender, about 7 minutes. Add peas, water, cover and simmer until peas are hot and tender, about 5 minutes longer. Toss with butter and serve.